Brussels: On Wednesday 11 April 2018, the Congress of World Hmong People (CWHP) screened David Beriain’s documentary “The CIA’s Lost Army” at the European Parliament. The screening was hosted by MEP Ignazio Corrao and included speeches and interventions by CWHP representative Mr Gymbay Moua and by Vietnam War veteran Mr Jack Jolis. As an introduction to the documentary, MEP Ignazio Corrao underlined the difficulties for the Hmong to advocate for their cause. Mr Jolis explained then how his experience in the CIA led him to meet the Hmong in Laos. Finally, Mr Moua, as one of the protagonists of the documentary, explained that he had to come back to Laos to prove the existence of these Hmong people living in isolation as advocacy was not enough. Then, the documentary presented the history of the Hmong people and their struggle in raising awareness about the ‘Secret War’ that still impacts their lives nowadays. The movie also focussed on the meeting between Mr Beriain and the CWHP representatives, and Hmong leader President Her and the emergency of the situation of the Hmong as they are the target of military attacks from the Laotian military. 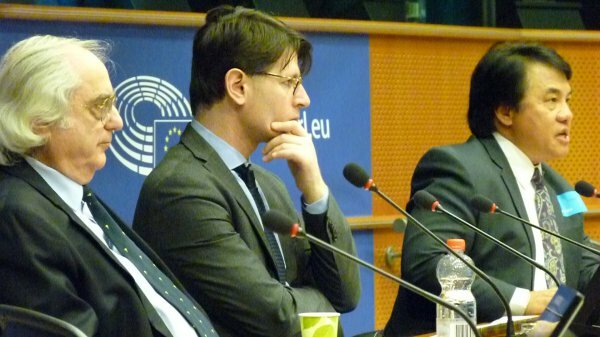 During the Q&A session that followed the screening, MEP Ignazio Corrao reaffirmed his support and commitment towards the Hmong issue. To conclude, Mr Jolis highlighted that he had not heard about any real interest from the public nor advocacy activity regarding the Hmong people from 1975 to 2015, when he was first contacted to participate in the movie. Finally, Mr Moua was asked by Mr Corrao about his expectations towards the European Union (EU) and the United States (US) regarding the Hmong issue. According to the CWHP representative, the Hmong do not even know what democracy is, since they have had no experience of it in Laos. However, they believe in freedoms of speech and belief. But because of their involvement in the Vietnam War, their historical presence in the region has been jeopardised. Mr Moua calls on the EU and the US to look back on the history of the Hmong in order to understand their current situation. Political solutions need to be found in order to allow the Hmong people to live peacefully. Ultimately, the CWHP calls on the EU to advocate for the demilitarisation of the Xaisomboun Special Zone, where the Hmong ChaoFa live, as well as for the organisation of international observation missions in the area. The press release is enclosed in the article.